I work for an environmental non-profit, and I know all too well the hazards of escalating carbon emissions and the resulting climate change. Sea level rise: you’re awful. This is data for 1993-2010 sea level trends (mm/year). Extreme weather like Hurricane Sandy. Ocean acidification wreaking our coral reefs. A shrinking polar ice sheet. 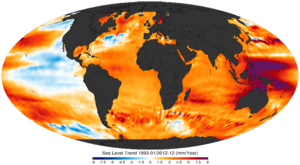 Rising sea levels consuming coastlines. Lots of sweat at inappropriate times. But I had no idea any squirrels were under threat, too. Precisely, the totally adorable yet oddly named Delmarva Fox Squirrel. Already endangered — thanks to its range that overlaps with some of the most populated areas on the planet (the Mid-Atlantic Seaboard) — this poor sub-species of the American Fox Squirrel doesn’t have the best long-range prognosis for survival. 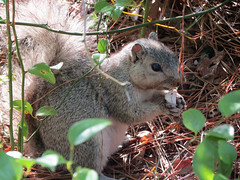 The Delmarva Fox Squirrel. Yes, it does look a lot like other squirrels. Not at all fox-like, except for the tail, perhaps?